D-Snips offer a unique ergonomically-designed handle that leverages your power, providing 1-1/2 times the cutting force with half the effort. The special “tail” on the handle that provides the added leverage also minimizes hand fatigue. Cuts are faster, cleaner and safer. Blades have file and scraper on both sides for cleaning wire; one blade is notched for non-slip stripping of 19- and 23-gauge wire. Blades are also serrated for non-slip cutting. 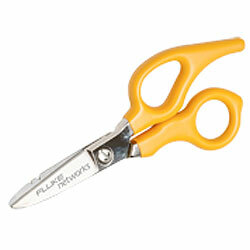 Made of high-quality forged steel these new D-Snips are durable time-savers.